Daniel Teruggi wrote an interesting article about the Syter system at INA - GRM in the booklet for Archives GRM (CD 4). This whole CD is comprised of works created through Syter. "To mark and celebrate the thirty years of the INA (Institut National de l'Audiovisuel), the GRM (Groupe des Recheches Musicales) has chosen to bring together an exceptional set of five compact discs, illustrating some of its most remarkable musical archives. These original works, which are often previously unpublished or have been dispersed throughout a host of other publications, are important because of the originality and audacity they testify to in the second half of the 20° century. Some listeners will be pleased to see that there are a number of illustrious composers here who, in the 1950s, frequented the studio of Pierre Schaeffer, and others will discover numerous musicians whose enthusiasm enabled this innovative musical genre to last throughout the following decades." From the very beginning, music, whether vocal or instrumental, improvised or written, and up until the invention ol recording processes, was listened to at the precise moment it was produced. The twentieth century changed all that, First of all with the appearance of recording media, which made it possible to listen to sound in a place and at a time other than those at which it was originally produced; then by the widespread use of electricity, which made it possible to invent new instruments and new ways of imagining and making music. Concrete music, electronic music, electroacoustic music, acousmatic music or contemporary electronic musics are all testimony to the same ambition: using electrical, electronic and computer-based technologies to invent the sounds of music. The invention of sounds is the invention of new forms of music, of new ways of looking at music, and is the logical consequence of the new opportunities that technology continues to provide us with. Musicians began to use computer systems a long time ago (1958) in order to synthesise sounds and to develop computer programmes that would enable them to combine sounds into musical works. Progressively it became possible to record these sounds, to process them or to hybridise them with synthetic sounds. Musical computer technology did not develop fast and was dependent on the way processors and data storage systems evolved; in 1958, a large computer in a research centre was necessary in order to produce a simple synthesised melody, which it was not even possible to record in the memory. These initial technical difficulties brought about the appearance of two concepts which could be described in a historical perspective, but which are often presented as if the were antagonistic: deferred time and real time. Deferred time described the way that the first computer systems were unable to produce an instantaneous result. Between the moment at which the intention was expressed and the moment when its result become an audible phenomenon, there was always a certain lapse of time. The user programmed a sound using software, defining its various parameters and timbre, and then the computer calculated the sound and, depending on the complexity of the calculation, produced the result ofter a given interval. The listening time was deferred with respect to intention time. It was logical that the next technological objective was real time, a concept that describes the possibility of hearing a sound at precisely the some time as the intention to make it is expressed. Moving over to real time required changes to the command tools. Deferred time was the result of a programming system whereby the user defined, using written language, the result he wished to obtain; moving over to real time made it possible to define the intentions instantaneously and to modify the result as it was being listened to. Now, most sound production and generation systems work in real time, enabling the user, thanks to various interaction tools (keyboards, mice, screens) to control and modify the sounds created and heard. Nevertheless, in the field of musical creation, and for a relatively long time, this technological evolution was opposed on methodological grounds. Real time obliges the operator to act and react, depending on the result, in a way that is similar to that of the instrumentalist. For many composers, deferred time, because it separated the moment of conception from the moment of listening, created a distance that was necessary for reflection, a situation that is similar to instrumental composition, between the writing of a piece on paper, and its being played. At the beginning of the 1970s, the Groupe de Recherches Musicales began to experiment using computer technologies. At the time, the Group already had 20 years of experience, a major repertoire of musical works, a tradition for profound reflection on music and perception as well as innovative technological research. Little by little, therefore, work was undertaken to look at the possibilities that this new domain, which was already strong in the United States, could offer in France, where it was comparatively little known. Two projects were to follow one another, and then coexist, between 1975 and 1993: the first, from 1975 to 1987, concerned the development of deferred time sound processing tools, the "Studio 123 software programmes", developments that are dealt with in CD 3 of the GRM Archives set. The second project, the Syter system was a major technological development for musical computer programming, so original that its impact can still be felt in the development of processing tools today. These two projects were vitally important in opening electroacoustic music up to composers from the instrumental world. The main successes of these two projects were to bring electroacoustic music out of the studio, making computer technology accessible, without needing programming skills, and making processing reliable and reproducible. The range of things it was possible to do to sound was considerably widened, using original and unheard of sound processing techniques. These two projects were a unique period for the GRM, the studios opened up to welcome composers with other ideas, concepts and points of view, the dialogue was rich and fruitful, and the understanding and analysis of the music being written there were enhanced. With the advent of computer technology, the first idea was to imagine a parametric control of machines using digital tools. For example, synthesisers, while remaining analogue in the way that the sound is generated, could be controlled by digital systems that would provide o greater precision in terms of frequency that traditional rotary buttons. It was thus that the first Syter was born, an acronym for: Synthése en temps réel (real time synthesis), and the objective of which was to build up a digital synthesis system based on a set of oscillators, controlled in real time by specialised gesture-based access or by external signals. The first prototype that was built was relatively simple, since its only function was to control, in real time, the movements of a sound source between a number of loudspeakers. This prototype, with its delicate control system and laborious programming, was used in concert on 16 March 1977 for the creation of Cristal by Francois Bayle. The designer of this tool and of its following versions was Jean-François Allouis, an engineer who arrived at the GRM in 1974, and who was fascinated by the potential of computer technology as applied to sound and music, and who had an uncanny inventiveness when it came to finding solutions to new problems and designing original systems. 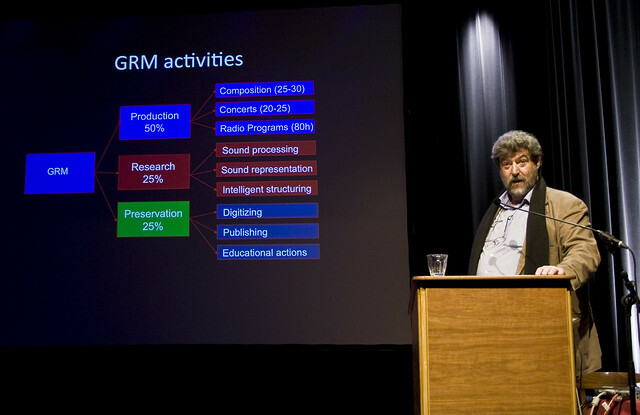 For this first concert, the acronym Syter become: Systéme temps réel (real time system), and was the starting point for a whole 5-year period of development during which Jean-François Allouis contributed to the setting up of the first GRM computer, oversaw the implementation of the deferred time processing system, built the Syter real-time sound processor and the input and output converters, developed programming software for the processor, built one of the first interactive real-time parameter control systems and programmed the first processing tools. In conjunction with computer scientist Jean-Yves Bernier and computer technician Richard Bulski, he needed to build and rebuild the system several times before the first full system was complete, in 1984. The system underwent very few modifications and additions, subsequent to that. Eight systems were built and sold, up until 1988. The software continued to evolve up until 1989, in particular thanks to the impetus of Hugues Vinet, who designed a digital mixing tool, providing the system with all the functions of a Studio. Two systems were in operation at the GRM until 1995, and around 100 works were composed in part or in whole using the system.